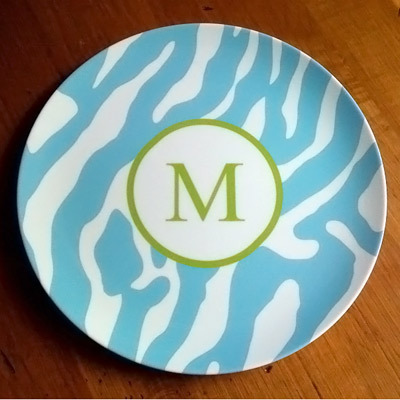 Make mealtime anything but ordinary with the Clairebella personalized melamine plates! 10″ plates are dishwasher safe and non toxic, but do not microwave. Text entered is case sensitive according to chosen font. Futura is available in lower case only. Greek, Monogram, Script and Times New Roman are available in upper case only. Several personalization styles are available; hollow circle, solid circle rectangle and ribbon band. Circles and rectangles are available with 1 initial, 3 initials or greek letters. Available in different colors. Estimated Ship Date: 2-3 weeks. For more details, click “Buy now”.